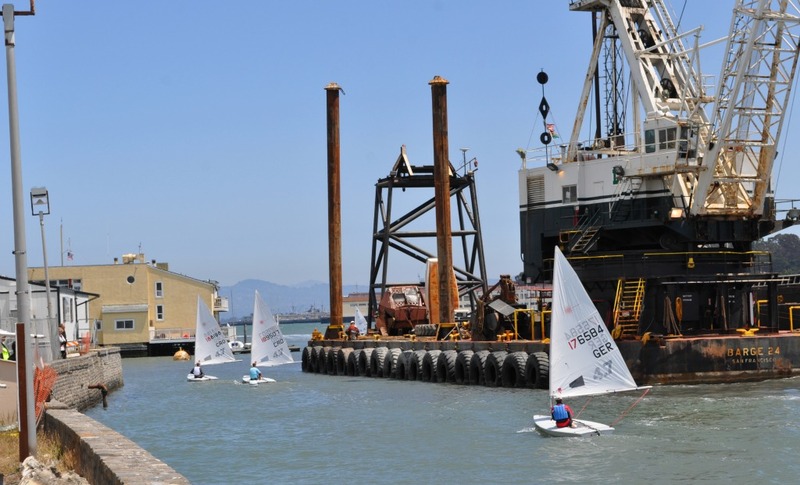 On the San Francisco cityfront, where 145 sailors and 110 volunteers wrapped the Junior Windsurfing Worlds on Sunday, Wednesday saw the practice race—not on the first attempt—for 165 juniors entered in the Laser 4.7 Worlds. Kids, it’s called The Ebb. 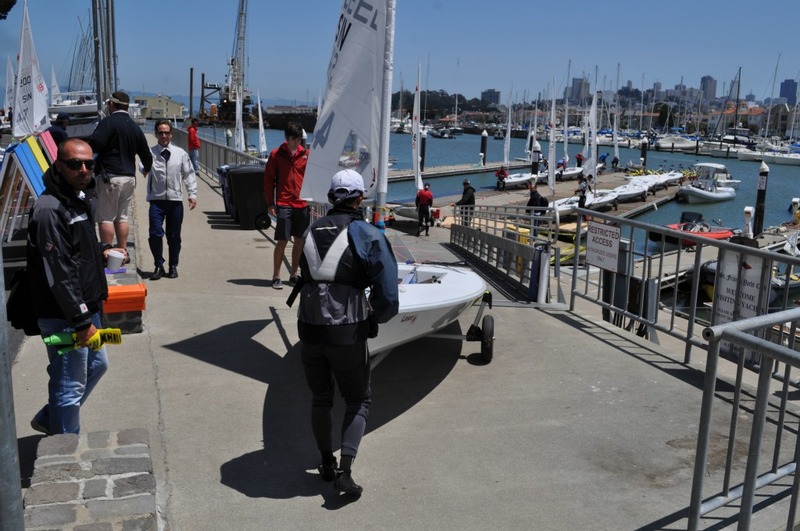 One-sixth of San Francisco Bay goes out and in twice a day, and The Ebb pushes upwind against the seabreeze and, yes, it will sweep you over the start line early and often. I reckon that’s why we have a practice race. 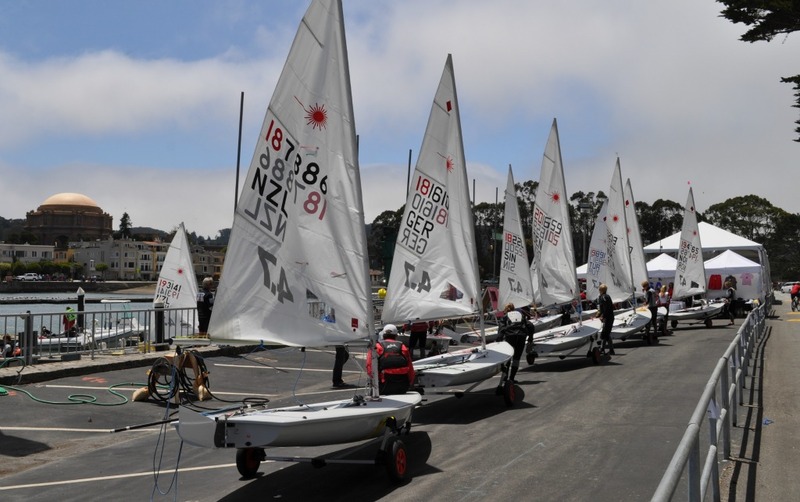 The junior championship continues through Tuesday, with Laser Slalom racing Wednesday and Thursday, registration and measurement for 247 Laser Masters competitors on Friday and Saturday, and opening races Sunday. How St. Frantic can it get? 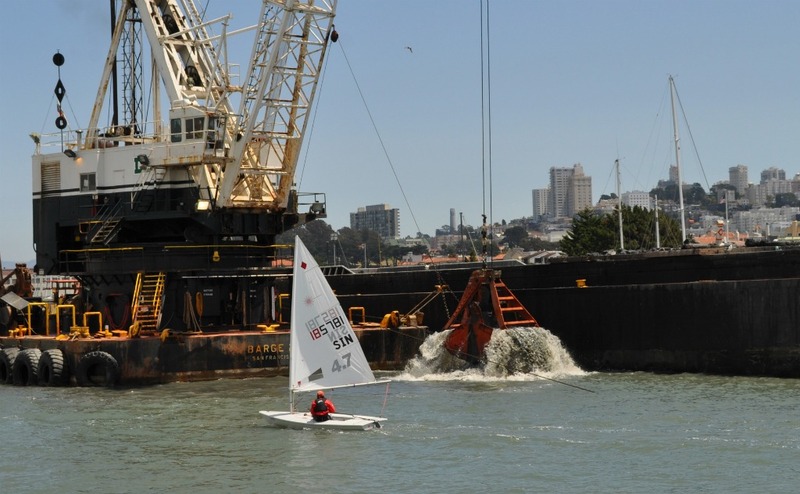 With the San Francisco Yacht Harbor torn up for reconstruction, and most docks removed, the club has towed barges into the basin for hauling the Lasers, which were squeezing between one ginormous dredge and the Golden Gate Yacht Club to get to the racecourse and back. 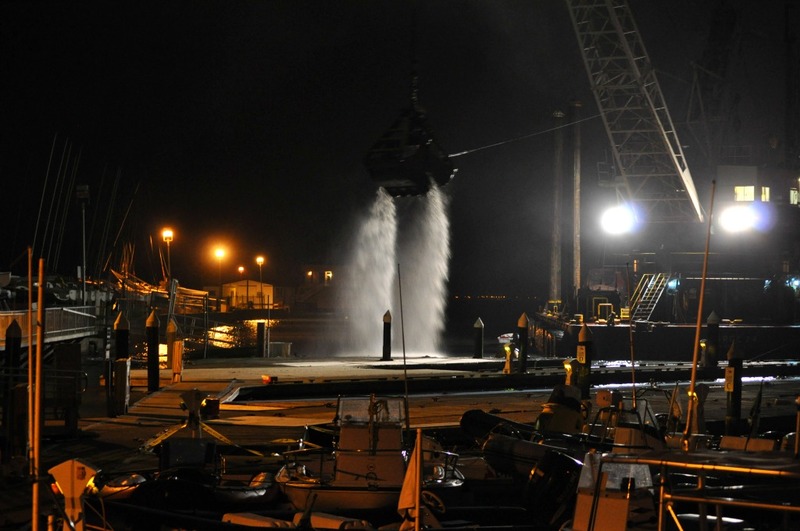 Hey, Dutra Group, are we gonna have a harbor for the Big Boat Series? And the evidence, from this pic shot at 2700, is that Dutra is cranking right along . . . 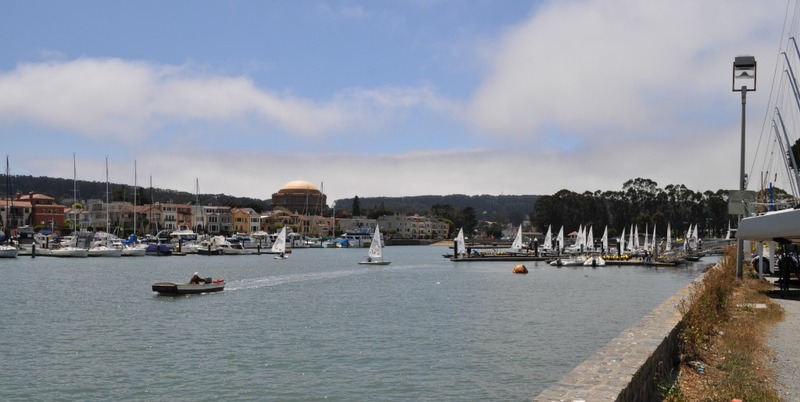 Switching back to a daytime view, If you haven’t been around lately, SF Marina might look a bit empty to you . . .
As ever, there is the jam-up of getting one Laser at a time down the ramp to launch. Having the barges in place for overnighting will save us from having to do this lineup every day . . .
Oh no! Not sweet Maud Jayet, come all the way from Switzerland to be mauled by a monster! Fortunately, we can report that Maud outfought the monster and went on to win the girls’ division of the Practice Race. In the evening there was the Opening Ceremony, suitably emotional. Every eye, at some point, went up to The Flag Of My Country . 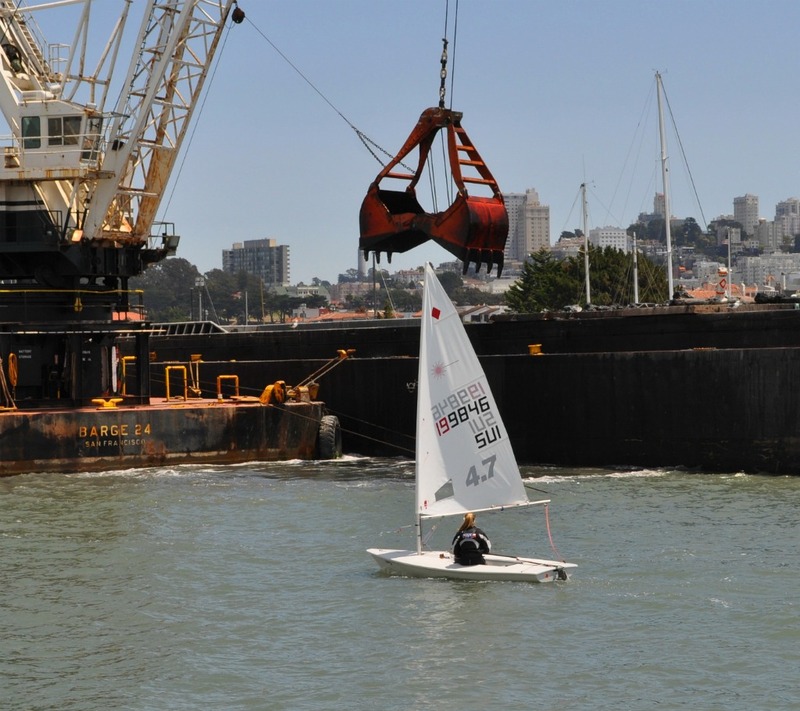 . .
And here’s a final-final from the Techno 293 Worlds: The wrap video.